Periodically, I plan to review various Linux distributions. At this point, I have five different Linux distributions installed through VirtualBox on my computer at home, and will be trying to write a review of each when I feel I’ve used it enough to comment on it. 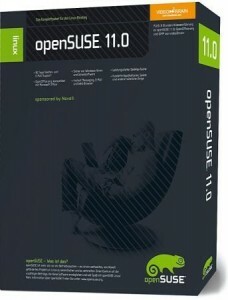 I will begin the series by reviewing OpenSuSE 11.0. I have been using SuSE since 9.1 was released, and have always enjoyed it. OpenSuSE 11.0 brings quite a few nice updates (discussed in a previous post) from the previous versions. However, I’m not really going to discuss the differences between 11.0 and previous versions, as I couldn’t do the same for other distributions. Instead, I will only be reviewing 11.0 as though I am a new user. OpenSuSE is actually one of the easiest distributions to install. The installation disc actually comes with a Windows installer that automatically configures your computer to boot into the installation interface when you restart your computer. Once you enter the installation interface, you have a few choices and configurations you need to make (setting your timezone, your keyboard setup, etc.). Then, you have to decide where you want to install SuSE, and you’re pretty much off to the races. You choose which software to install by selecting groups of applications (for instance, if you choose to install a Web server package, SuSE will automatically select all of the packages that you would normally need for a Web server). All along the way, you have the option to go with the default, change some simple options, or enter an advanced configuration wizard. After you go through the initial configuration, the installation runs pretty well on its own, with very little interaction from you. I would also like to add that, of all of the Linux distributions I’ve installed, so far, OpenSuSE has absolutely the most attractive installation interface. In fact, ArsTechnica actually wrote a short article about how attractive SuSE’s installer really is. There are quite a few different desktop environments available for Linux. The two main environments are KDE and Gnome. Novell offers OpenSuSE with Gnome and KDE packages (among four or five other desktop environments). I chose to install the beta version of KDE 4 as my desktop. OpenSuSE is actually one of the very few Linux distributions that is built to work with any of the desktop environments, with no real preference toward any. Most of the distributions are built with a specific desktop environment in mind (usually either KDE or Gnome), and then offers the other desktop environments almost as an after-thought. I am not a huge fan of KDE 4, actually. There are still a lot of kinks that have yet to be worked out in KDE 4, including the fact that you cannot hide any of the panels on the desktop (where your start menu, taskbar, quick launch, etc. would be in Windows). It’s also extremely difficult to add shortcuts to the desktop, etc. However, that is getting off on a tangent, as that’s not really a reflection on SuSE so much as it is on KDE 4 (which can be used on any Linux distribution). As with any Linux distribution, you can install popular software like Firefox, Opera, a LAMP (Linux, apache, MySQL, PHP) Web server, OpenOffice, GIMP (Gnu Image Manipulation Program) etc. However, I will be attempting to review the software that’s built specifically for OpenSuSE, to help differentiate between the various distributions. Really, the only major differences you will find between Linux distributions are the administrative programs, such as software installation and configuration and hardware administration. In SuSE, the program used to control most of those aspects of the system is called YaST (Yet another Setup Tool). YaST is a very user-friendly, easy to use and powerful program that should make Windows users comfortable if they are accustomed to using the Control Panel. YaST is divided up into nine different categories (as shown in the screen shot to the right). The categories are fairly self-explanatory. 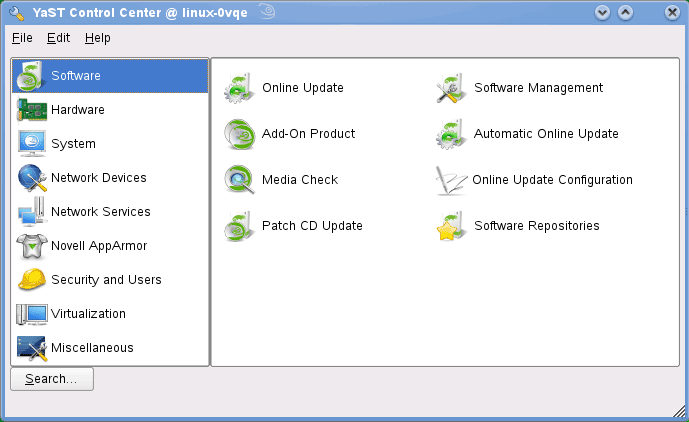 Software (shown highlighted in the screen shot), allows you to manage the software installed on your computer. From here, you can set up and run automatic online updates, you can install and remove software, you can check the md5 checksum of your installation media (to make sure that there are no irregularities or errors on the disc) and you can configure software repositories (which are the media from which software updates are obtained – these can include network resource, CDs and DVDs, local drives, etc.). Hardware is the category in which you can (duh!) configure most of your hardware. You can configure your monitor and graphics card, any infrared devices you may have, your keyboard, your mouse, printers, scanners, tv cards and sound (among others, depending on what you have installed). Within the system category, you can configure various system-related options, ranging from your system clock and calendar up to re-partitioning your hard drive. Within these two categories, you can configure items such as your DSL, modem and ISDN settings, as well as various network settings like a SAMBA server, an LDAP server and/or client, FTP server and more. Network Devices is comparable to the Network Connections area within Windows, and Network Services is comparable to the Network and Sharing Center. Network Services is where you would go to set up a new network or connect to an existing network. Novell AppArmor is essentially an internal firewall for SuSE. You can set up various profiles to allow and block specific software from performing specific actions. Within Linux, user profiles are much more important than they are in Windows. All actions and files are only available and accessible to specific users. Therefore, it is important that user and group profiles are configured properly. Within this area, you would configure a “hypervisor”, which is basically a way to run virtual guest operating systems within your operating system. VirtualBox is a virtualization program, as is VMWare. Obviously, this is where all of the various configuration options were put that didn’t fit in any of the other categories. Within this area, you can view release notes, various logs and more. As mentioned above, within YaST, you can configure and run software updates. OpenSuSE uses its own software updater called Zypper. Zypper is a really nice update application, automatically locating new versions of any software you have installed on your computer. Zypper is very reliable about checking for pre-requisites and possible conflicts before installing anything, which is great. The other difference you’ll find between most Linux distributions is the system menu. Most of them are similar, but there are subtle differences between each. SuSE’s system menu (using KDE, at least) is very nice, and very easy to use. It is organized efficiently and logically into various categories. Recently, the three major players in OpenSuSE support merged their forums together and brought all of their power users together. In many cases, to find help on a particular subject related to OpenSuSE, users had to post on all three forums to find the right answer to their questions. Now, however, users can simply visit the official OpenSuSE support forums, which are integrated nicely with the official OpenSuSE support and documentation wiki. In all the years I have been using OpenSuSE, I cannot remember ever having a problem go unsolved for very long after posting in any of the OpenSuSE support forums or searching the documentation wiki. As mentioned earlier, I have been using SuSE for quite a while, and have a great deal more experience with it than I have with any other Linux distribution. Therefore, it is difficult for me to make an unbiased review of the operating system. However, I also have to say that the reason I’ve used SuSE almost exclusively is because it is so attractive, efficient, familiar and easy to use. On a scale of one to ten, I would have to give OpenSuSE 11.0 an eight. There is always room for improvement in anything, but most of the elements of OpenSuSE are exactly the way I would like them to be. It is very easy for a lifetime Windows user to slip right into using SuSE without very much of a learning curve. 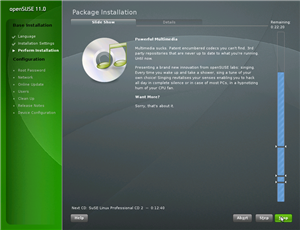 If you are interested, you can find a very quick review of OpenSuSE 11.0 with a Gnome desktop at http://theunixgeek.blogspot.com/2008/06/opensuse-11-review.html. You can also find a fantastic screen shot tour of the operating system, beginning at the opening installation screen at http://distroblog.com/opensuse-11-alpha-0-review/. Finally, there are a handful of positive reviews found at http://www.osnews.com/story/19895.